We’ll take care of your children! ChildsPlay Nursery first opened in May 2008 as a child friendly café. Since then it has grown into a thriving business and has expanded into a full private nursery. Privately owned, business partners Jo Courtney and Simone Rual saw a gap in the city for something a little different both having extensive working backgrounds within the childcare environment. Jo has 11 years experience working as a Registered Childminder in Torfaen under the CSSIW, Simone’s background is in Fashion and Textiles with extensive management experience, followed by 5 years experience in Adult Education and 3 years in Youth and Community, both taking a very hands on approach within the nursery. 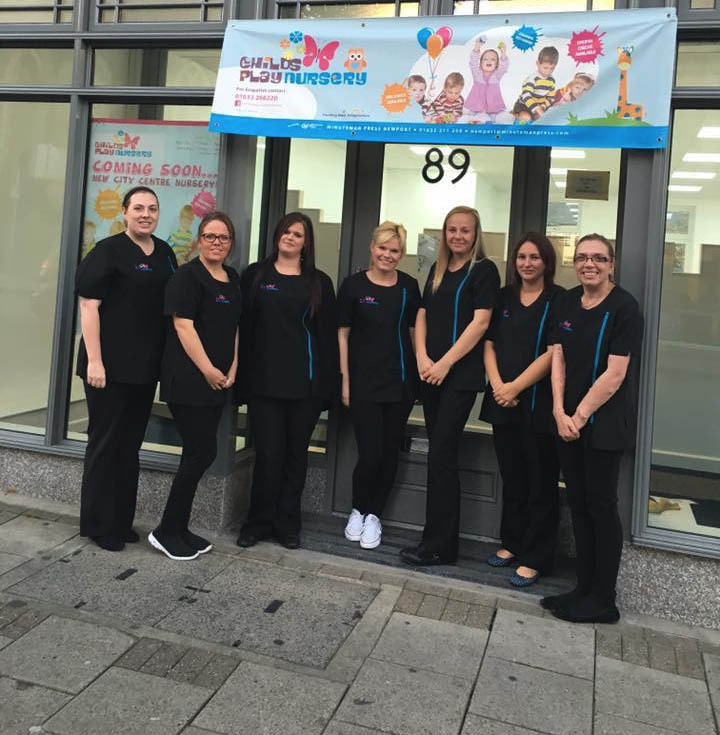 At ChildsPlay Nursery, our day care facility is located on the ground floor, we can cater for all your children’s needs between 7.45am and 6pm or later by appointment. The Outdoor play area has a range of facilities suitable for all ages. Our play areas are designed to encourage learning in a fun, friendly and supportive environment. So drop the children off for the day and relax knowing that they are safe, having lots of fun and making new friends. ChildsPlay Nursery is committed to providing a setting which will promote high quality child care in a warm, caring and safe environment, free from prejudice and discrimination. Thus enabling all children to feel happy and relaxed and able to develop to their full potential. The first five years of a child’s life are important and informative years and at ChildsPlay we focus on the individual needs of each child. We understand that learning is a continuous journey that can be fun and exciting, achieved through play. During a child’s early years they will learn and build on all the things they have already experienced, encountering new and interesting challenges along the way. All of our staff are qualified and have undertaken an enhanced DBS and reference check. Training in Paediatric First Aid, Food & Hygiene and Safeguarding Children is updated regularly. We accommodate all dietary requirements and work hand in hand with parents to ensure these needs are met. It is our role not only to assist the development of your children and to collaborate with the children’s carers, but also to ensure that your children are most of all happy and self-motivated learners. We pride ourselves in being a friendly and welcoming nursery where children want to come and play and parents are happy to leave their precious little ones in our care. Every child’s learning journey takes a personal path based on their own individual interests, experiences and the curriculum on offer. With this in mind, our environment is prepared to support all areas of learning and development. We understand that learning is a continuous journey that can be fun and exciting and achieved through play and during a child’s early years they will learn and build on all the things they have already experienced, encountering new and interesting challenges along the way. Our staff are selected not only for their competence and knowledge of a child’s development but also for their passion and commitment. Most of our staff are qualified and all staff are enhanced CRB and reference checked and trained in First Aid, Food & Hygiene and Safeguarding Children.